Review: Alicia Gaspar de Alba and Alma López, eds. Our Lady of Controversy. Alma López's "Irreverent Apparition. Austin: UTexas Press, 2011. The woman in López’s photograph poses arms akimbo, head tilted. Her face stares straightforwardly out, unsmiling lips expressing ‘what are you looking at?’ confidence. Some viewers were looking outragedly at the figure’s floral bikini. Then the naked breasts of the putto at la Virgen’s feet. All Hell broke loose, propelling López to well-earned prominence among American artists, as well as enduring scorn from nattering whatevers. At the time, López likened the scourging to a 21st century inquisition, cites Alicia Gaspar de Alba, in her introduction to her co-edited collection Our Lady of Controversy. Alma López’s Irreverent Apparition. 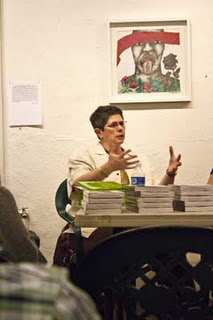 The eleven chapters include essays by López and Gaspar de Alba, as well as Tey Marianna Nunn, Kathleen Fitzcallaghan Jones, Deena J. González, Luz Calvo, Clara Román-Odio, Emma Pérez, Cristina Serna, Catrióna Rueda Esquibel. It takes a rare editor to allow such liberties, but then Gaspar de Alba’s introduction, “Our Lady of Controversy: A Subject That Needs No Introduction”, kicks off the collection with understated aplomb. Chapter 2, Nunn’s “It’s Not about the Art in the Folk, It’s about the Folks in the Art: A Curator’s Tale.” Chapters 7 and 8, gender / nation, life / virgins, López’s final essay santa / fe feature the same figure, chiasmus. 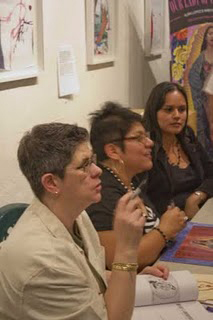 By focusing on one controversial piece of art in one small exhibition in Santa Fe, the chapters show the complex intersectionality of cultural politics, historical memory, and gender dynamics that informs exhibition practices and public reception…they also use Our Lady as a case study for examing the different chiasmi—or opposing ideas—that took center stage in the controversy. 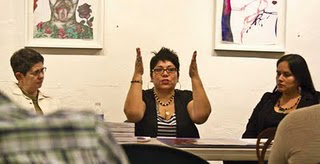 She could as readily pointed to Clara Román-Odio’s subtitle in chapter 6, “Queering the Sacred: Love as Oppositional Consciousness in Alma López’s Visual Art” for an explanation. Oppositional consciousness, a gem of a phrase so explicitly accounts the demands chiasmus places upon readers. I suppose if one has to explain a joke it’s not that funny. This table of contents, however is the exception. Most cool, editors. 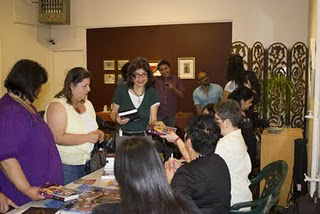 Bound with the book comes a DVD, “I (heart) Lupe” that is a “conversation with Ester Hernandez, Yolanda M. López, and Alma López.” Viceroy Butterfly Productions. As I am reading the book I purchased for my wife’s Mothers Day gift, the disc remains sealed. For an idea of the DVD contents, see the promo at the artist’s website. Affordable in paperback, a collector’s gem in hardback, buyers will appreciate the publisher University of Texas Press’ superb reproduction quality in color plates and adequate b&w detail. America Needs Fatima is protesting "Our Lady" print at the Oakland Museum of California. They have received thousands of emails requesting to remove the print from the exhibition Contemporary Coda. They have also planned a protest on May 21 at the museum. Please send them an email of support, and cc me at almaloveslupe@gmail.com. America Needs Fatima is also protesting the Our Lady of Controversy: Alma Lopez's "Irreverent Apparition" edited by Alicia Gaspar de Alba and myself on amazon.com. They are writing horrible reviews. Please log on to amazon.com and write a review here. Panelists sit aligned behind folding tabletops, backs to walls of Northwest Los Angeles’ Avenue 50 Studio. Christine Serna, sitting right, speaks first. Alma López asks Serna questions and gets encyclopedically detailed answers echoing Serna’s published essay. Serna is a model in López's work. 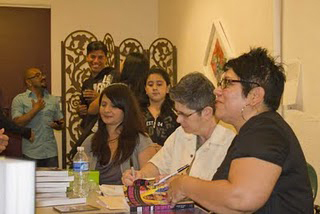 Serna autographs one page featuring her bicep tattoo'd with López's Sirena Guadalupe embrace. The image prefaces Serna's chapter 8 essay, "It's Not About The Virgins In My Life, It's About The Life In My Virgins." 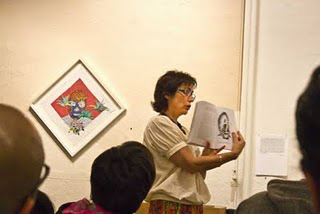 Alma López defines a duality in fusing her chicana impressions with Mexico’s Virgen de Gualdalupe image. 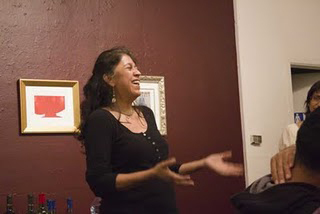 Alma López tells the packed gallery she did not intend to brew controversy when she agreed to hang her photograph of a floral-bikini’d Virgen de Guadalupe floating above a bare-breasted angelita with butterfly wings. The house smiles delightedly learning the symbolism infused in the butterfly species involving lepidoptery, immigration, mimicry, regeneration, change. Alicia Gaspar de Alba places López's Lupe in a context sweeping across time from the legendary cloak to a series of chicana images including López's. The DVD features three of the artists. 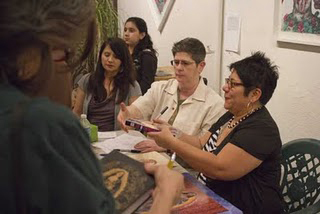 Lara Medina, professor of Chicana/o Studies at CSUN, and Avenue 50 Board Member, illustrates her discussion with an image from the evening's book. 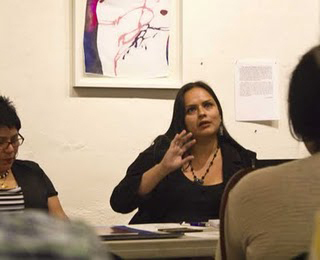 New Mexico artist Pola López joins the discussion. Several artists in the house expressed their own experiences confirming those in tonight’s spotlight. The book is one of those confluences that match literature, art, conscience, and rhetoric to one another. The signing line paced leisurely as each person enjoyed passing conversations with the panelists. Gaspar de Alba signed and kept hash marks on a handwritten chart. Beautifully printed serigraphs, magnets, and books. Dozens of books. She confesses to losing count, relying on subtraction to calculate the pair's evening sales. Buyer's remorse but your great fortune! The publisher sells the hardcover at a genuine bargain. Its gold-embossed Lupe on black weave makes an impressive presentation for a graduating student. The paperback is cutthroat priced, too. Contact the University of Texas Press to complain, or place an order.